Hospitals as health care providers, can not be separated from environmental influences or pressures that lead to a decrease in the number of patient visits. 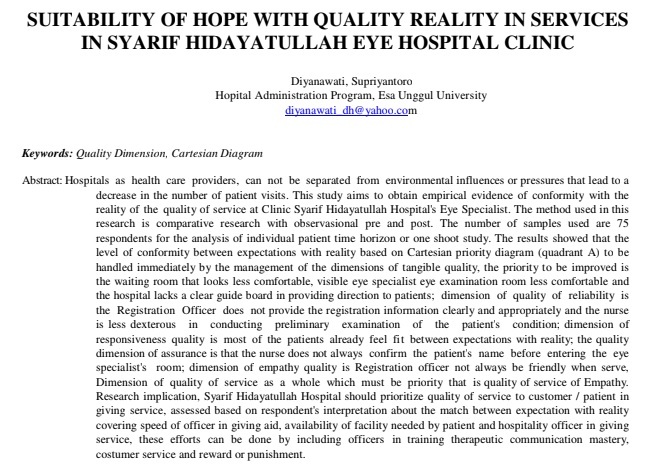 This study aims to obtain empirical evidence of conformity with the reality of the quality of service at Clinic Syarif Hidayatullah Hospital’s Eye Specialist. The method used in this research is comparative research with observasional pre and post. The number of samples used are 75 respondents for the analysis of individual patient time horizon or one shoot study. The results showed that the level of conformity between expectations with reality based on Cartesian priority diagram (quadrant A) to be handled immediately by the management of the dimensions of tangible quality, the priority to be improved is the waiting room that looks less comfortable, visible eye specialist eye examination room less comfortable and the hospital lacks a clear guide board in providing direction to patients; dimension of quality of reliability is the Registration Officer does not provide the registration information clearly and appropriately and the nurse is less dexterous in conducting preliminary examination of the patient’s condition; dimension of responsiveness quality is most of the patients already feel fi t between expectations with reality; the quality dimension of assurance is that the nurse does not always confirm the patient’s name before entering the eye specialist’s room; dimension of empathy quality is Registration officer not always be friendly when serve, Dimension of quality of service as a whole which must be priority that is quality of service of Empathy. Research implication, Syarif Hidayatullah Hospital should prioritize quality of service to customer / patient in giving service, assessed based on respondent’s interpretation about the match between expectation with reality covering speed of officer in giving aid, availability of facility needed by patient and hospitality officer in giving service, these efforts can be done by including officers in training therapeutic communication mastery, costumer service and reward or punishment.